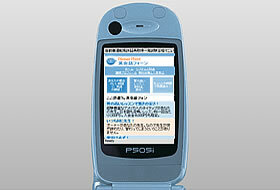 Cell phone (keitai) version of main site (eikaiwaphone.jp). (Note, this site is made for viewing on mobile devices so may look strange on PCs). This is the second time I have worked with Jeremy and I continue to be highly satisfied with their work and customer service. On this project, Jeremy designed a cell phone version of my current PC site. The site was up and running very quickly and the end result looked fantastic. As usual, Jeremy proved to be very knowledgeable and answered all my questions regarding cell phone specific sites.